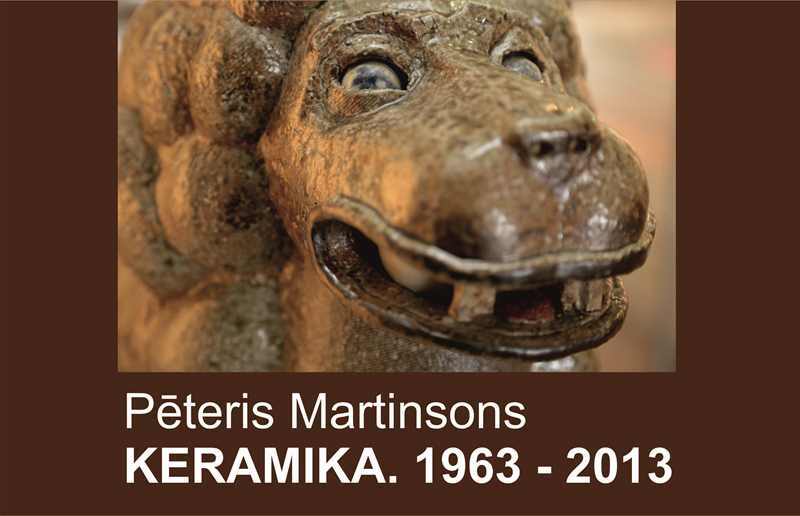 Pēteris Martinsons (1931 – 2013) is the best-known Latvian ceramist in the world. For more than a half of a century, his art and personality have impressed and inspired ceramists of different generations both in Latvia and abroad; his achievements in international competitions have regularly attested to the excellence of his art; the radiance coming from his personality has given a creative charge to his colleagues during workshops and symposiums, to his students, to the participants in his master workshops and to those simply encountered on his way. The personality of Pēteris Martinsons is amazingly versatile – he is an architect by education, has been professionally engaged in mountaineering, a teacher of Riga Applied Art Secondary School and Art Academy of Latvia, has been a stage designer for several theatre performances in Valmiera theatre, and has been filmed in several roles. He has traveled a lot, mainly to work there, but has always come back. Back to his own country, which he always called – the most beautiful. In 2013, Pēteris Martinsons donated the selection of his creative life works to Daugavpils Mark Rothko Art Centre. The exhibition “Pēteris Martinsons. Ceramics. 1963 -2013” shows part of this collection – the most characteristic works from different periods, supplemented by texts illustrating what the author thinks about life, art, values. Pēteris Martinsons was born in Daugavpils and lived there until the age of 13, when during the bombardment of World War II the house of the Martinsons family was destroyed; and here his first ceramic works – puppet heads – were made from the clay found on the canal bank near the electric power station. Later, the Martinsons lived in various places of Latvia – Ainaži, Mazsalaca, Smiltene, and finally – in Alūksne where Pēteris graduated from the secondary school. In 1957, Pēteris Martinsons acquired the qualification of a professional architect and worked in this capacity for several years, until his interest in mountaineering and teacher’s work in Riga Applied Art Secondary School led to his first encounter with clay in 1963. Pēteris Martinsons joins the community of Latvian ceramists of the 60-s of the 20th c. as a man from the street – with a fresh vision and artistic ambitions unfulfilled in architect’s job, who, now, sees ceramics as the right platform for fulfilling them. The 2nd half of the 60-s is the time of getting acquainted with the material – mutual studies of opportunities. Birds, horses and first wheel-thrown pieces are created. In 1965, Pēteris Martinsons gets an opportunity to work in the Latvian Art Fund experimental workshop in Ķīpsala, which for several decades becomes the home for his creative work. The plasticity of clay is revealed in groups of humorous figures of devils, they are also his first works which start traveling from exhibition to exhibition outside Latvia, however small plastic works are soon replaced by plastic and thematically imbued relief (Icarus of Priekule, Legend about Evelyn Rou), and later by monumental pieces of garden ceramics (“A Thinker”, “The Offended”) and generalized compositions (“Cubes”, “Dedication to Desert Flights”). In 1971, the first Pēteris Martinsons solo exhibition is held; he becomes a member of the International Academy of Ceramics; in 1972 he receives the first international award – gold medal for the group “Cubes” in the International Ceramics Competition in Faenza (Italy). In 1973, at the symposium in Behin (Czechoslovakia), Pēteris Martinsons has the opportunity to work with porcelain for the first time; he studies it, grows fond of this material and continues to work with this material during his whole lifetime. At the end of 1980 and the beginning of 1981, an enormous amount of works is created in Poltava (Ukraine) porcelain factory, the compositions “Poltava Touches” and “Other Worlds” being most significant among them. In 1981, Pēteris Martinsons exhibits works created in Poltava on a big solo exhibition arranged in the Vault Hall of the Foreign Art Museum. This exhibition becomes a major Latvian art life event also due to its original display by Ivars Blumbergs. The 80-s of the 20th c. is a productive and prolific period in his work, the period when the opportunities of working intensively in the USSR Art Fund Dzintari Artists House and in Ķīpsala still exist, but gradually greater opportunities of going to international symposiums are also offered. In 1985/1986, Pēteris Martinsins works with stoneware in Lvov factory of ceramics and sculpture, synthesizing functional vessels with high-quality graphic drawing – this is represented by the group “Tea Graphics”. In 2000, Pēteris Martinsons retires from Art Academy of Latvia and together with painter Vilis Vizulis goes to Africa. Lions, which he did not manage to see in nature, become now the most popular image of his works; they are created almost at every symposium and can be seen in many countries throughout the world – in the museum of Eastern Europe ceramics in Fuping (China), in the international ceramics studio in Kecskemet (Hungury) as well as in other places. Objects lighted from inside, where light is an essential means of expression, are created from porcelain, too (“Lamps”). The last and fully completed work by Pēteris Martinsons – a chamotte sculpture “The Shelter of Dream Crows” – is created in June, 2013, Jelgava. There are themes and motifs to which Pēteris Martinsons returns again and again – dream crows, monumental figures of lions, complicated structures of towers and stations. Stylized living beings are not merely a skilful depiction of some nature motif, and fragile porcelain constructions are not an end in itself as well – in each Pēteris Martinsons’s work, like in a powerful accumulator, through textures of materials, through touches of the artist and flames of the kiln – honesty and integrity are encoded. Honesty about his works, about himself, life and art.